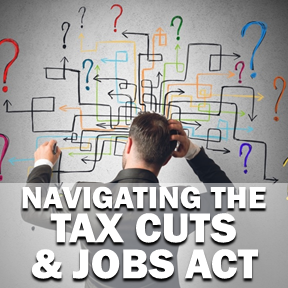 Many of the changes instituted in the Tax Cuts and Jobs Act (TCJA), signed into law in late December 2017, go into effect this year. It is very likely that these sweeping changes will have tax consequences for most of us who deal with U.S. tax compliance. We at Raich Ende Malter had the opportunity to present to our clients some of the key highlights that I would like to recount to you here at The REM Cycle. The most widely impactful component of the TCJA is the reduction to tax rate for both corporations and individuals. Corporations are subject to a flat rate of 21%, while individuals enjoy a rate reduction or shift in threshold at each tier of the seven graduated rates, including a drop to the highest rate from 39.6% to 37%. The clear result is less federal tax revenue across the board and, with all other things being equal, taxpayers paying less tax. The corporate change is permanent, but the individual change reverts back to prior provisions after eight years. The hottest topic (and most hotly discussed and misunderstood) is the 20% deduction for taxpayers that have income from a pass-through entity or sole proprietorship. To utterly simplify the concept, most taxpayers in such a situation will enjoy a deduction of up to 20% of the taxable income figured on their personal tax return. This measure was added to increase parity for pass-through entities with the massive corporate tax rate cut mentioned in the previous topic. The nuance to this is incredibly complex and the law as written seems to contradict the plain English contemplation by the legislators in the conference agreement on the law, but we all need further guidance from the IRS to understand. This change is subject to sunset provision. Evan Piccirillo delivers a talk on the TCJA in New York City on February 9, 2018. This is the next most important topic that most people aren’t talking about. This provision has far-reaching implications for leveraged taxpayers and it may force many taxpayers to reconsider the structure of their financing. With some exceptions, interest expenses arising from the normal course of business will be capped at 30% of a taxpayer’s adjusted income (EBITDA/EBIT), the excess will carry forward indefinitely. The rules that govern this provision, specifically with respect to pass-through entities, are also incredibly complex. To really describe their intention, the IRS will have to issue some guidance. This is a permanent change to the code. It’s a bonanza for taxpayers that purchase capital property for the next few years. 100% expensing is the new normal for most property (some exceptions for real property). This is designed to spur more businesses to invest. Some provisions, as written, appear to be broken and require technical corrections (fixes) to the law, while others are subject to phase-outs over time. Most itemized deductions are suspended, as are personal exemptions. State and local taxes (property tax plus income or sales tax) are limited to only $10K. Charity, mortgage interest, and investment interest round out the remaining itemized deductions. These changes mean most individuals will be taking the standard deduction on their personal income tax return, which has nearly doubled. These changes sunset after eight years. Our next post will go into further detail on each of these topics, and further information will be added as guidance emerges from the Treasury Department. We will also explore some items later in the year that have not been outlined above, and we feel people should understand how to take full advantage.